This is a mechanical and electrical modification to the Feiyu Mini3D 3-axis brushless gimbal, so it can hold a Crazyfire HZ-100P SDI camera and LIDAR-Lite distance sensor. Now I can use this small and inexpensive gimbal for the new live streaming cat robot! This entry was posted in 3D Printers, Electronics Videos and tagged 1080p, 3d printing, autodesk fusion 360, crazyfire, feiyu, gimbal, lidar, lidar-lite, pulsed light, sdi, t-glase on May 27, 2017 by Micah Scott. I’ve been streaming lots of live forward and reverse engineering lately, and I’m about to start editing some of the recent work into a multi-part series of videos! But this little self-contained project had been sitting partially-edited in my queue so long, I had to give it the finish it needed. Here we have a retrospective look at an old Vacuum Fluorescent Display project, and a re-make into something new using 3D printing and magnets. This entry was posted in 3D Printers, Electronics Videos and tagged 3d printing, mi6k, vacuum fluorescent display on May 15, 2017 by Micah Scott. Finally, another Boldport video! This time a short music video based on the Engineer Superhero kit, assembled in original form and in a variant that includes a coin cell to power the LED and a piezo button to charge the 2N7000 MOSFET gate and make the LED glow for a while. This entry was posted in 3D Printers, Electronics Videos and tagged 2n7000, 3d printing, bold port club, boldport, closeup, electronics, kit, macro, mosfet, music video, pcbmode, piezo, soldering on August 22, 2016 by Micah. This is a quick photoblog and a video to document my first experience with using the support material options in Skeinforge. This was on my Makerbot Thing-o-Matic with a MakerGear stepper extruder, 0.35mm nozzle, and aluminum/kapton heated build platform. 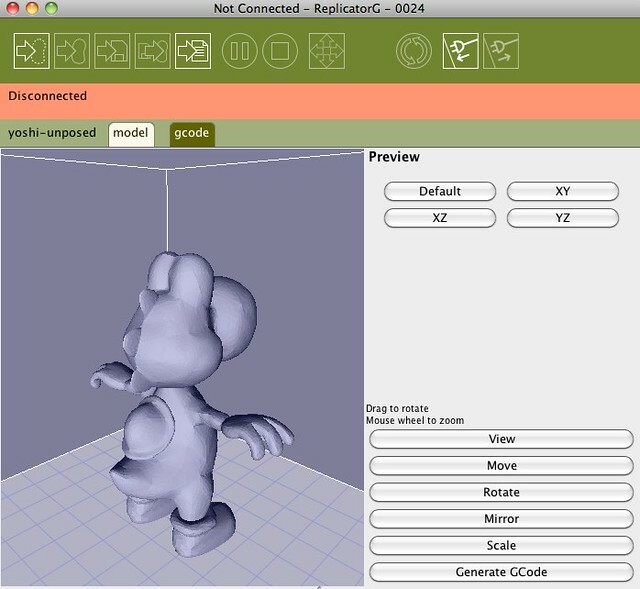 The model I’m printing is Yoshi, the familiar Nintendo character. I cleaned up and subdivided the original low-poly model in Blender, ran it through the Netfabb cloud for good measure, then ran it through Skeinforge 35 via a fresh ReplicatorG built out of the git repository. I’m printing raftless using an 0.3mm layer height. No Comb, and definitely no Oozebane. But the awesome newish Reversal and Outline plugins are your friends. 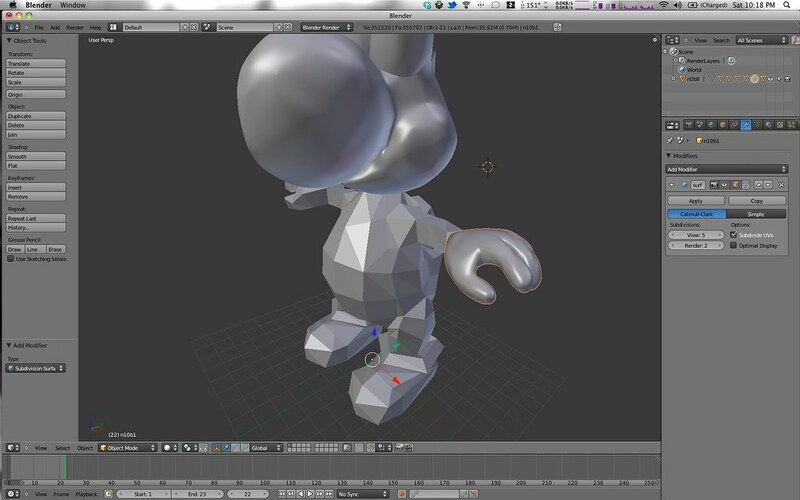 I’m using full support crosshatch, with a minimum support angle of 46 degrees, a flow rate of 75%, and gap ratio of 1.5. 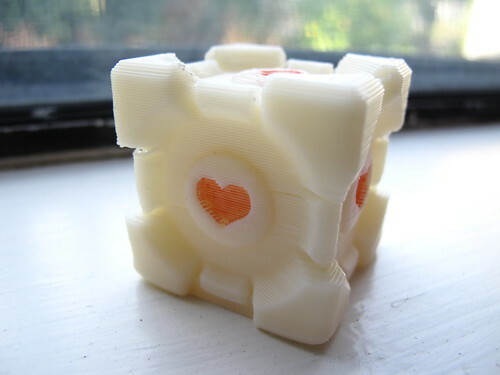 This entry was posted in 3D Printers and tagged makergear, photo, skeinforge, video on February 12, 2011 by Micah. If you’ve ever wanted to build a model on your MakerBot without a PC attached at all (or perhaps you just never have a USB cable quite long enough to reach…) there’s an easy solution! 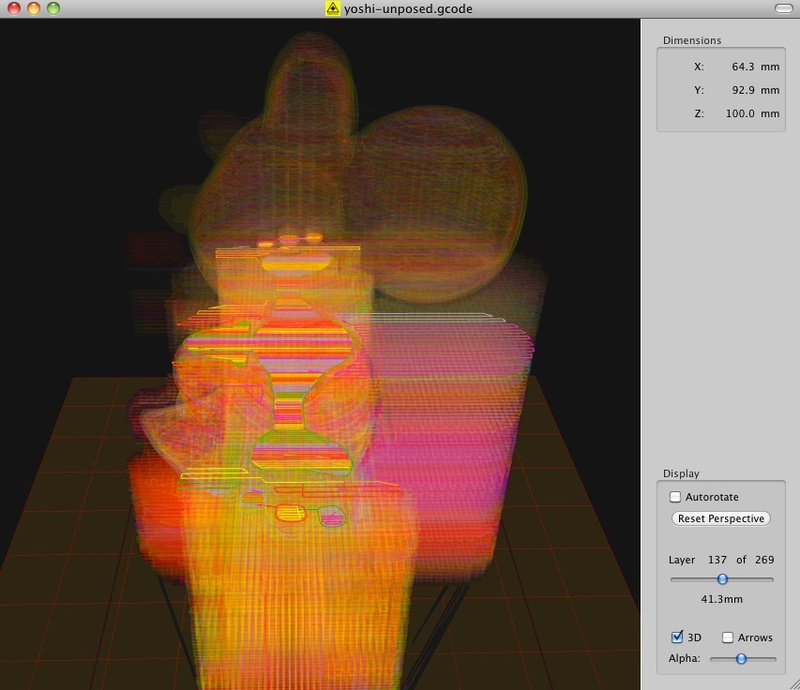 This is a quick one-line addition to the V2 MakerBot motherboard firmware. 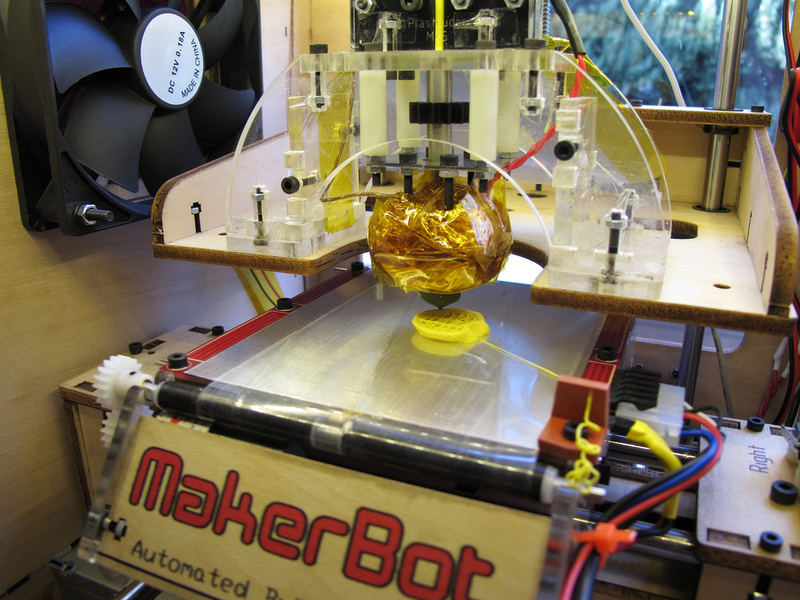 With this change, your MakerBot will start up normally unless there’s an “autoexec.s3g” file on the SD card. If there is such a file, it will immediately start building from that file. This way, after you’ve got your MakerBot set up, you can do builds simply by copying a file to SD card and turning it on. If you need help compiling and installing new MakerBot firmware, check out the V2 Firmware page on the MakerBot wiki. 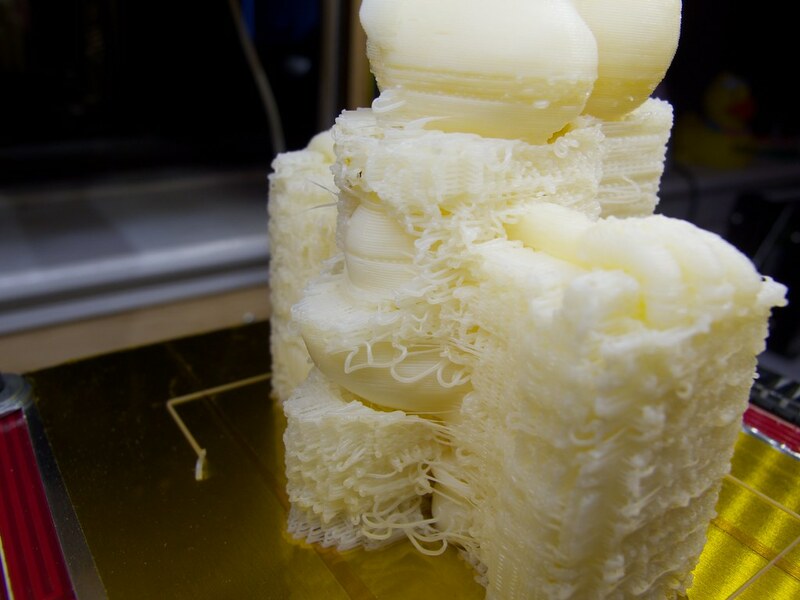 This entry was posted in 3D Printers and tagged makerbot protip on February 12, 2011 by Micah. New build surface, sheet aluminum and hot Kapton. Using the Skeinforge Reversal plugin. Say goodbye, Comb and Oozebane. 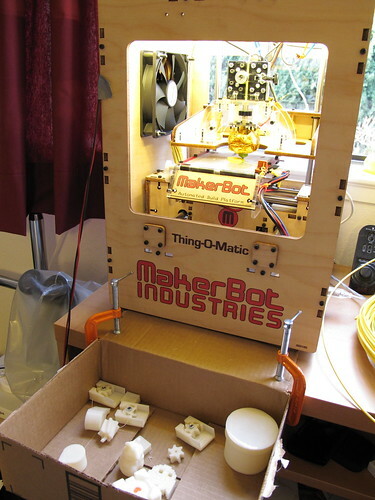 This entry was posted in 3D Printers and tagged makerbot upgrade makergear stepper on February 8, 2011 by Micah. This post is mostly an apology for not having done anything blog-worthy in the past few months. As usual, life has been full of Things. Like Katamari Damacy. Kinda. 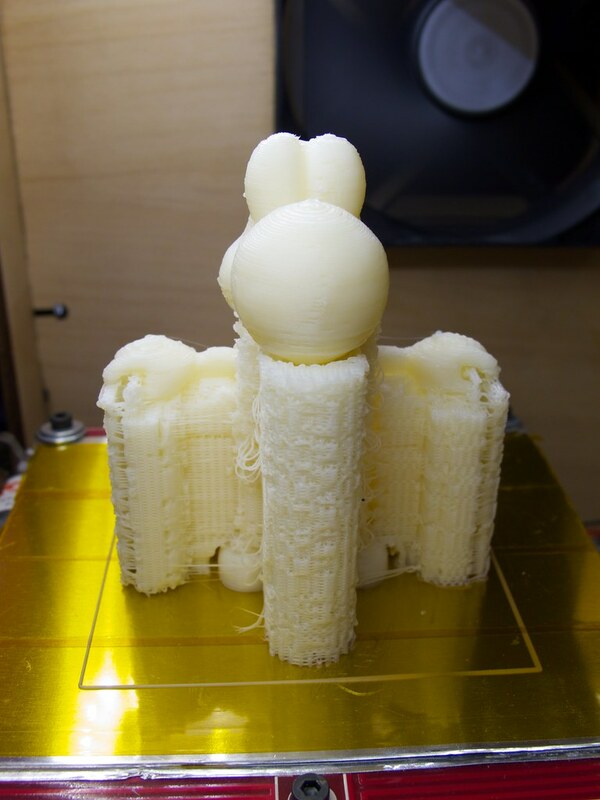 3D Printing. Seems like a space ripe for DIY innovation, and besides, it’s really cool. Other sorts of odd CNC machines. Like a computer controlled sort-and-place for fabricating Perler Bead designs automatically. Electronic Jewlery, assembled at microscope-scale. Ropes of twisted 40 AWG wire with LEDs soldered along them in a Charlieplexed matrix. That sort of thing. And perhaps I can make something half as pretty as Zelle‘s stuff. You know, something actually important. Like solving world hunger, or making computers more efficient or more secure, or solving Big Problems in human rights. But who has time for that, let’s play with microcontrollers. Starting at step #1 then, I recently got the Makerbot Thing-O-Matic kit that I preordered. 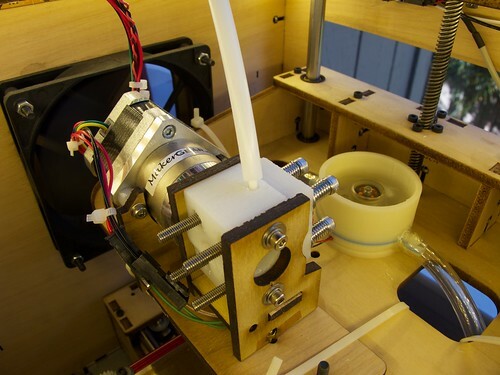 It’s pretty cool- a relatively cheap way to get into 3D printing, and every single part is open source and hackable. This is my first 3D printer, so I’m not really qualified to write a review of it just yet. But I can briefly list the things I like and don’t like about the kit. It’s relatively easy to put together. I got my kit on a Friday afternoon and had time to get it printing by (late) Sunday night while also taking a day off to socialize. 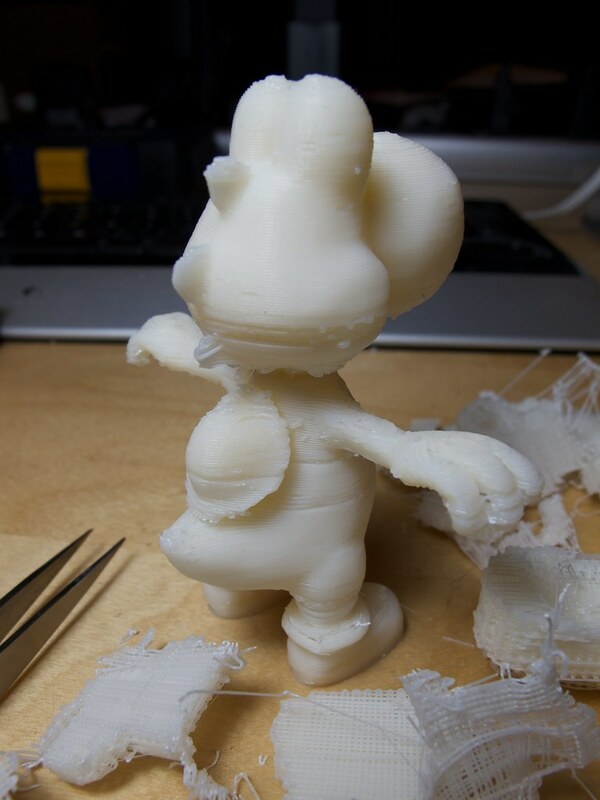 With default settings and pretty much no futzing with the belts or Skeinforge, the print quality is pretty fair. 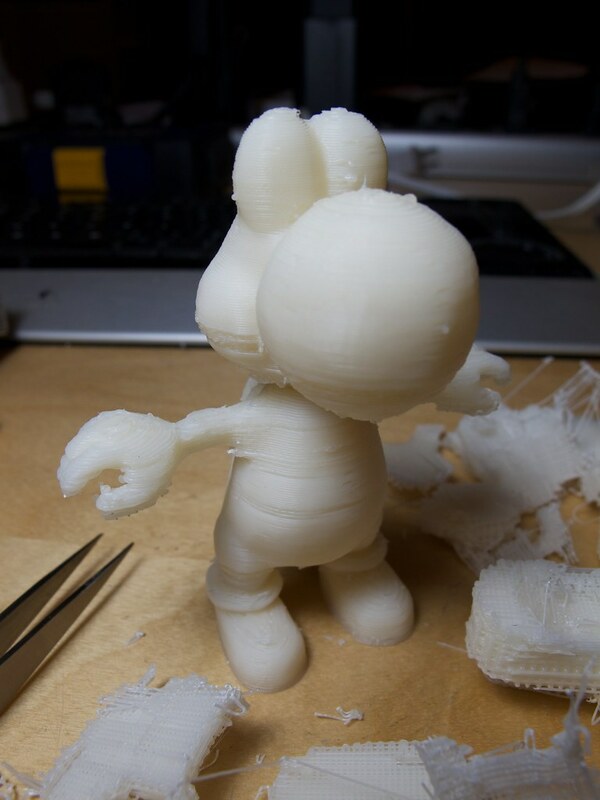 And with only a bit of tweaking, you can do decent prints at a 0.4mm layer height. From what I can see, the mechanical parts are fairly good. Feed rates seem relatively fast for a low-cost CNC machine, and while the machine as a whole tends to wobble and vibrate a lot, the machine is quite rigid where it counts. The MK5 extruder has a very solid mechanical design, and it grips the plastic filament quite heartily. The conveyor belt is cool, and it was fun printing several parts back-to-back without manual intervention. The motor on the MK5 extruder. This motor bugs me. A lot. For starters, mine had a common problem in which the motor stalls randomly, overheats the H-bridge, and generally makes a mess of the whole system. I traced this back to a particular mechanical state in which the motor needs upwards of 2 Amps to un-stall, when it normally runs at less than 50 mA. Ow. This is more current than the H-bridge can handle, so it just gets hot and the motor goes nowhere. Right now I’m working around the bug by using a relay to drive the motor, but that’s a dreadful hack. Even when the motor works, the extrusion rate is unpredictable and uncontrollable. The extruder controller’s PWM is worse than useless (The docs warn of it damaging the motor?) and even at a constant voltage, the actual extrusion rate changes based on lots of factors- age of the motor, tension on the filament drive gear, phase of moon. So the thickness of the extruded plastic is, in turn, quite variable. The electronics and firmware seem a bit.. I hesitate to say this, but, amateurish? I can’t help but think that there’s a better processor for the job than an AVR, and I think the Arduino layers are getting in the way more than they’re helping. The modular design also seems like needless complexity. Six PCBs? Really? The software which generates toolpaths, Skeinforge, is actually quite nice and configurable. Now I’m just about the biggest Python fan of anyone I know in person, but I still get very frustrated by how slow this tool is on more complex models. It also seems to frequently do rather bizarre things- like generating toolpaths that could easily be one continuous segment, but are instead several disjoint plastic threads that are placed down in very suboptimal order. I’ve already ordered a Makergear stepper extruder with 0.35mm and 0.25mm nozzles. Can’t wait to try this out! I’m tempted to try my own toolpath generator. I know everyone and their mom are writing Skeinforge replacements these days, but it seems like this could be a fun project to tie in with my interest in computer graphics and graphics-related algorithms. I’m also quite tempted to design my own all-in-one controller board for Makerbots and RepRaps. I’m picky about these sorts of things, so I really want some real-time guarantees in the motor controllers, and I want to never have to worry about the processor reading in g-code slower than the motors can move. So I’ve been thinking about doing something based on an XMOS, Propeller, FPGA, or ARM. And it’d be one PCB, with one processor, and all of the stepper drivers and FETs onboard. Anything else would just be a waste of board space and wire. I also kind of want a faster uplink to the PC, either Ethernet or USB 2.0. So, we’ll see if these go anywhere… All of the above ideas are just ideas now, and their implementation or lack thereof is subject to my level of boredom! 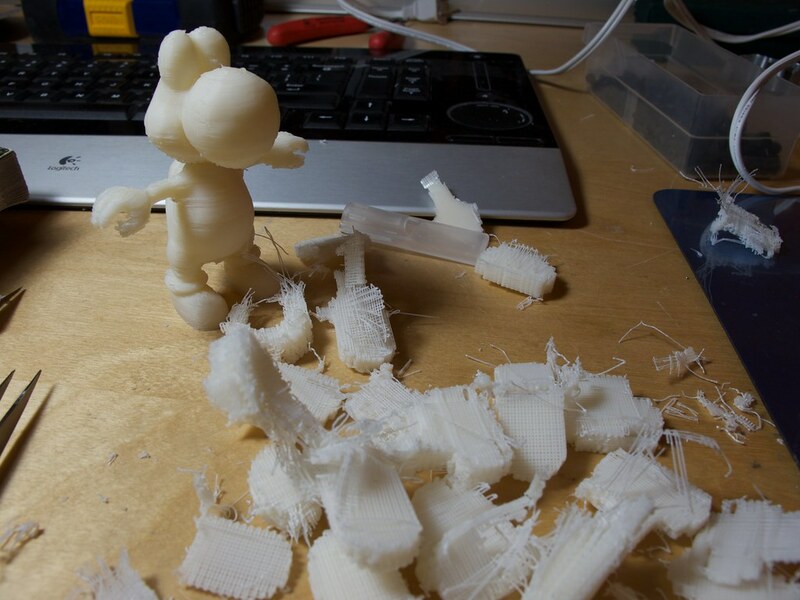 This entry was posted in 3D Printers, Projects and tagged fdm, ideas, makerbot, toys on January 5, 2011 by Micah.